Pour the milk into the bowl of a standing mixer, and sprinkle in the sugar and yeast. Stir to combine and then let sit for about 5 minutes to let the yeast begin to come alive. Whisk in the egg, egg yolk, melted butter, vanilla and orange zest. Fit your mixer with the dough hook, add 5 cups of the all-purpose flour and the nutmeg and mix on medium-low speed until the dough begins to come together. Slowly add enough of the remaining cup of flour so that the dough comes together into a soft, slightly sticky ball. Depending on the humidity in the air, this might take the entire remaining cup or only a bit of it. What you’re looking for is a soft, smooth ball of dough that clings to the dough hook, does not stick to the sides of the bowl, but does stick slightly to the bottom of the bowl. If you stop the mixer and touch the dough, it should feel slightly sticky, but not so wet as to be confused with cookie dough. Once the dough has come together, sprinkle in the salt. Let the mixer knead the dough for about 8-10 minutes. The dough should look very soft and smooth. Butter a large bowl and dump the dough into the bowl. Butter a piece plastic wrap (or spray with non-stick spray) and use it to cover the bowl. Let the dough rise at room temperature for 1-2 hours, until doubled in size. Add the lemon juice to a medium size saucepan. Peel, core, and dice the apples into pieces about the size of a pea. As you chop the apples, add them to the saucepan and toss them around in the lemon juice to prevent them from browning. Add the rest of the filling ingredients to the saucepan. Stir to mix and set over medium heat. Cook, stirring frequently, until the apples are soft and the liquid in the pan is thick and syrupy, about 15-20 minutes. Scrape the filling into a bowl and let cool to room temperature, stirring occasionally. Cover two large baking sheets with parchment paper and set nearby. Dump the dough out onto a clean work surface and roll it into a square that’s approximatly 16 inches. Spread the apple filling over the dough and roll the whole thing up into a very loose log. Using a dough scrapper or the edge of a metal spatula, chop the dough from one end of the log to the other into pieces that are no bigger than 1-inch wide. Push the pieces of dough into a sloppy mound in the center of your workspace and continue to chop the dough every which way, so that you have a gooey pile of small pieces of dough and apple filling. Use your hands to scoop up a palm sized portion of dough and apples. Gently press the dough together in your hands and lay it down on one of the parchment covered baking sheet. Continue with the rest of the dough, leaving at least 4 inches in between fritters on the baking sheets. This is a messy job – so have fun with it! Spray a couple of sheets of plastic wrap with non-stick spray and cover the fritters. Let rise at room temperature for 1-2 hours, until nearly doubled in bulk. OR – place the sheets of fritters in the refrigerator to rise for up to 12 hours. Put the powdered and salt in a medium size bowl and add 3/4 cup maple syrup and the vanilla and almond extracts. Stir until smooth. Add more maple syrup if necessary to create a consistency similar to cream. Cover and set aside. If the dough has been rising in the refrigerator, let the sheets of apple fritters sit out on the counter for about 1 hour to allow the dough to come to room temperature. Pour enough vegetable oil into a large, deep saucepan to come up the sides 3 or 4 inches. Heat the oil to 350 – 370 degrees. Cover a baking sheet or serving platter with a few sheets of paper towels and set it near the stovetop. Cut the parchment around two of the fritters so that it extends around the fritter by a couple of inches. Using a spatula, lower the fritters into the hot oil one at a time, parchment and all. Using metal tongs, gently lift the edge of the parchment paper, flipping the fritter over in the hot oil, and lifting the paper away. Cooke the fritters for about 3-4 minutes on each side, until they are a deep golden brown. Do your best to keep the oil temperature between 350 and 360 degrees. Using a slotted spoon or spatula, transfer the fritters to the paper towel lined platter. Within 1-2 minutes of the fritters coming out of the hot oil, drizzle the tops with a generous amount of maple glaze. 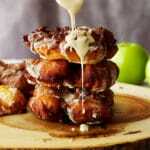 Apple fritters are best served soon after frying.